Fresh and hot off the press is the newly available Technology Preview of the Veeam Managed Backup Portal for Service Providers (VMBP)! This newest addition to the Veeam product line is an complements to the already popular, Veeam Cloud Connect for Service Providers. 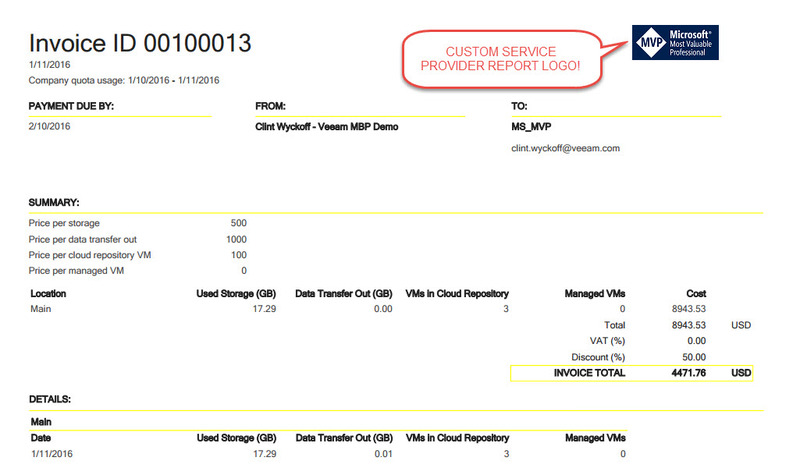 VMBP, for short, allows our existing Service Providers that are leveraging Cloud Connect to streamline the delivery of their Veeam-powered services. In the first release of VMBP the offering is ONLY available through Microsoft Azure. Let’s take a look at the deployment, setup but first what are some basic features of VMBP? First step in the deployment process requires a Microsoft Azure Subscription, with this you get access to the Azure Resource Manager (ARM) Portal or Portal.Azure.com – Within the Azure Marketplace, a simple search for ‘Veeam’ locates the VBMP Virtual Appliance. It’s really not an appliance per se – it’s simply a Windows Server 2012 R2 VM that’s pre-installed with VBMP and Veeam Backup & Replication V9 – RTM (9.0.0.773). After we answer some questions about our Azure environment and then our VM will be fully deployed. With this we can now remote desktop into the VM with the public IP Address <ServerName:3389>. This information is obtained by navigating to Virtual Machines (not classic). Navigate to https://localhost and you’re presented with a login. Here you login with an administrator account on the server. 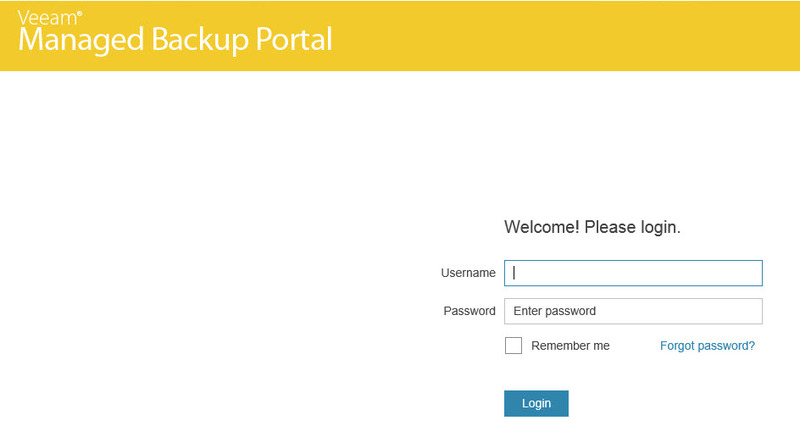 Next up is the initial configuration of the backup portal. Keep in mind, VMBP is focused around Service Providers; billing and overall client management are VERY important components! Follow through the steps with company name, service provider CUSTOM LOGO, subscription plans, email / alert notification and tenant user accounts. The subscription plan gives Service Providers the chance to customize their service offerings. 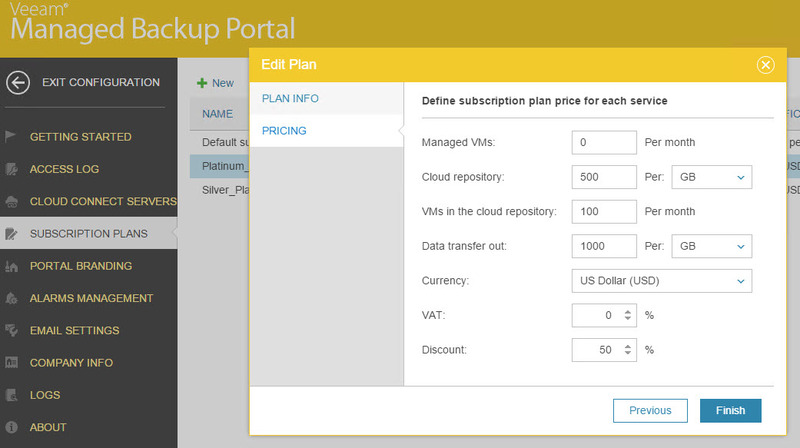 In my example I’ve created a Platinum pricing model that charges per GB and a cost for retrieving data out of my Service Offering with a discount of 50% being my Platinum level. My Silver offering only offers a 10% service discount with the same costs per GB and Per GB retrieval. With our Portal all setup it’s time to create a tenant account for our customers to consume. This is done within the main section of the Portal by clicking on companies and new. Within here you define basic customer information including their credentials as well as their cloud repository. The tenant needs to connect to the cloud resources within the Service Provider infrastructure, this is done through their on-premises Veeam installation. 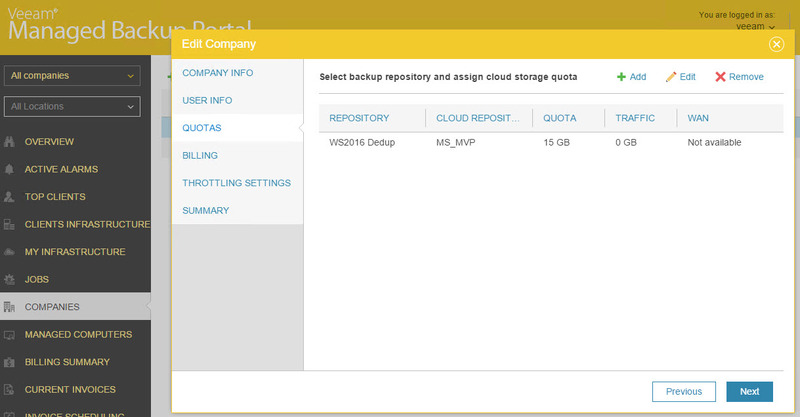 Within their Veeam Backup & Replication console navigate to backup infrastructure and right click on Service Provider and choose ‘Add Service Provider.’ The Service Provider will provide the tenant with the appropriate connection information including FQDN, login user name and password. These same credentials are used to login to the tenant portal. The item of note within this creation wizard is that the tenant needs to check “Allow this Veeam Backup & Replication installation to be managed by the service provider.” With this checkbox enabled the tenant Backup & Replication server downloads and installs the required integration components. With this, the tenant is completely prepared to begin to send VM backups off-premises via on-premises backup copy jobs. With this the Service Provider receives quite a plethora of information. The main overview page allows high level information from all of their customers, ie. companies. On the top left you can quickly filter by customer to drill in to specific tenants information. Within the portal the client infrastructure area gives even more details about their Veeam installation including alarms and overall health of the on-premises Veeam Environment. 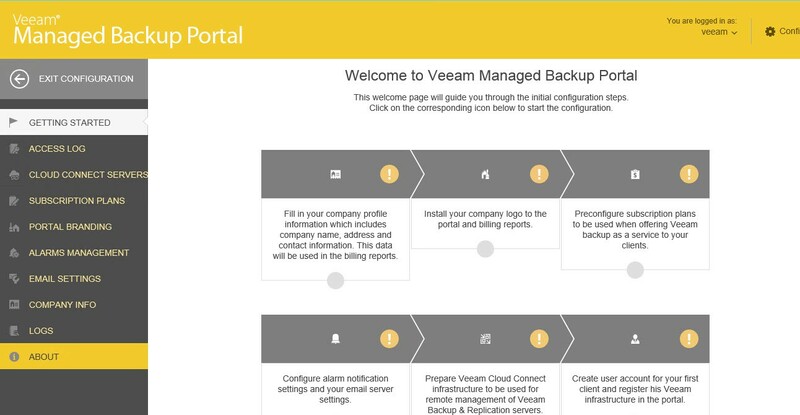 Veeam Managed Backup Portal offers Service Providers great levels of insight into their tenants environment allowing them to make educated recommendations. The jobs area within the portal gives deep insight into tenants job information including the ability to remotely start, stop and retry jobs. Also, included is the ability to download logs. 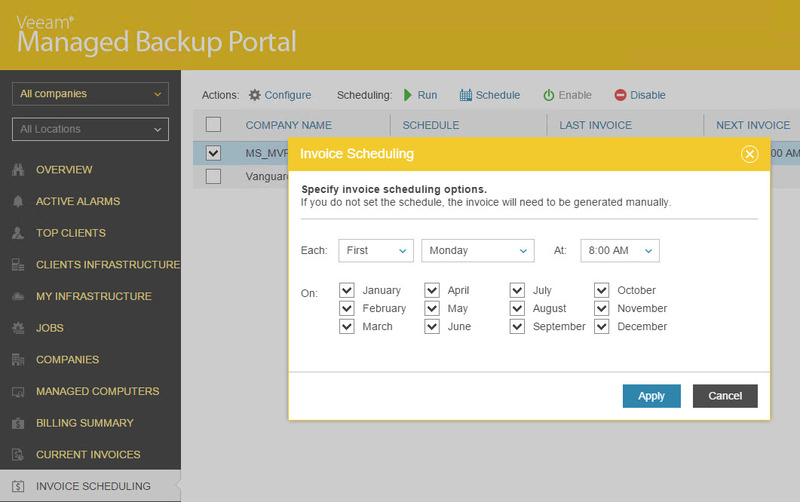 The last step in the process is to define the invoicing schedule. With everything setup and running as a Service Provider you’ll be all set and ready to begin invoicing your customers automatically. With being a tenant also comes access to the tenant web portal. Within the tenant portal customers can easily view their usage as well as environmental jobs, protected VMs, active alarms and billing information. Probably the most important piece for both the tenant and service provider is the billing! Tenants want to know how much the services will cost, so that the appropriate expense funds can be budgeted. While the service provider wants to know how much am I owed. Tenants can receive their invoices automatically via the scheduling engine or alternatively through the tenant web portal. Whether you’re a new Service Provider or an existing that’s looking for innovative ways to differentiate, with Veeam it’s super easy and simple to either extend the current offerings to include Disaster Recovery as a Service (DRaaS) or Backup as a Service (Baas)! Interested in becoming a Veeam Cloud & Service Provider or are you looking to request a trial key to kick the tires?